A man accused of murdering a father by shooting him in the head and dismembering his body told gardaí when he was arrested: "He was my friend." 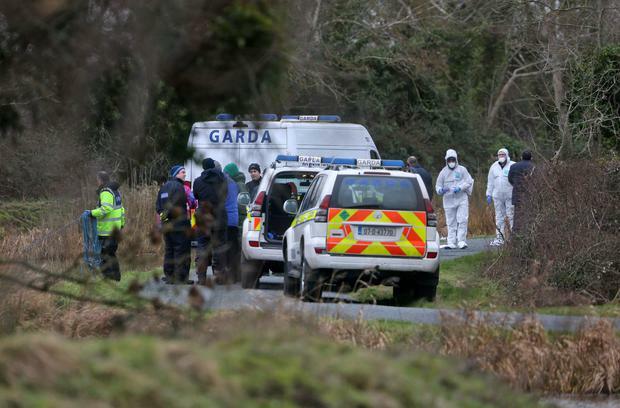 Paul Wells (50) made the reply as he was cautioned after gardaí raided his home following the find of the dismembered body of father-of-one Kenneth O'Brien. His torso was found in a suitcase in the Grand Canal, with the other body parts wrapped in heavy cloth shopping bags also recovered from the waterway. The jury heard gardaí retrieved a bullet from Mr O'Brien's severed head that was consistent with it having been fired from a semi-automatic pistol. Mr Wells, of Barnamore Park, Finglas, Dublin, has pleaded not guilty to murdering Mr O'Brien (33) at that address between January 15 and 16, 2016. Seated in the courtroom, Mr Wells wore a black suit and listened impassively to the evidence. Mr Wells admitted to gardaí that he shot him dead but claimed it happened when they struggled during a row after Mr O'Brien turned up at his home with a gun. He maintained that Mr O'Brien had wanted to have his own partner, Eimear Dunne, murdered and Mr Wells refused to kill her. Gda Sgt Edward Moore told the Central Criminal Court he went to the accused's home address at 8.30am on February 6 to arrest him, cautioning Mr Wells that he was not obliged to say anything, to which the accused replied: "He was my friend." The court heard Mr Wells's black Audi A3 was seized and brought for examination. A number of items including two laptops, a mobile phone and a Meteor Sim card were seized, as well as a blue box from a Nokia phone. Det Sgt David Conway, of the Garda Technical Bureau's forensic team, inspected a shed in the accused's back yard where sections of the carpet were treated to show the possible presence of blood. An electric radiator showed a bloodstain. There was further staining in the boot of the car. Damage to the bullet recovered from Mr O'Brien's head was consistent with it impacting a hard surface, which was "consistent with it passing through the bone of a skull," Det Sgt Thomas Power, of the ballistics section, said. Earlier, the jury heard from Patrick Holligan, a broadband installer who was one of the last known people to see Mr O'Brien alive. He said Mr O'Brien was in "good form" the day before he went missing but noted he "didn't seem too happy" about going back to work in Australia. Mr O'Brien said he "wasn't overly looking for work" for the next couple of months as he had made some money in Australia. The jury also saw CCTV footage of Mr Wells driving west out of Dublin towards the area in Co Kildare where Mr O'Brien's remains were found. Det Gda Gerard Byrne said he was called to Sallins, Co Kildare, on January 24, 2016, following a call from members of the public who had retrieved a bag from the canal and "had suspicions about what might be in the bag". In a heavy duty black shopping bag lying on the bank, he found a "flesh coloured" object which he believed was a foot. Gardaí from the Garda Water Unit further recovered two heavy-duty shopping bags, weighed down with red bricks, from the canal bed. CCTV footage showed Mr Wells at Mr O'Brien's home on December 28, when the two went in and out of the shed and looked at construction equipment. He was seen at Mr O'Brien's home again on January 11, 2016, with the two men seen chatting, looking at work Mr O'Brien had carried out and shaking hands. Mr Wells was seen at the bank a number of times making withdrawals, while on January 16, his dark Audi was seen driving out towards Ardclough in Co Kildare.